It’s no wonder that some children don’t like to read in school. 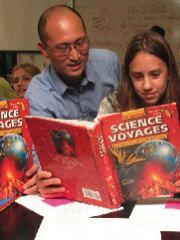 When kids complain textbooks are difficult and boring, UF Professor Zhihui Fang believes they might actually be right. Through his research, Fang is finding that school language is a sort of foreign language for some children. He has investigated what young children learn about this language under different instructional conditions. More recently, Fang has turned his attention to the linguistic challenges involved in reading academic subject texts at the secondary level. He has just completed a study that investigates the process and impact of infusing reading instruction in a middle school science curriculum. With his colleagues in special education, Fang is currently embarking on another project, also funded by the U.S. Department of Education, to prepare highly qualified middle and high school special education teachers who can meet the academic literacy needs of students with learning disabilities and those from culturally diverse backgrounds. “In order to succeed in school and ultimately in society, children must learn this language, however peculiar or alienating it may sound,” Fang says. Although Fang knows children’s everyday language serves a different purpose than school language, he contends that there is a need to forge a connection between the two. “The teaching of school language is most successful when it builds on students’ knowledge of everyday language,” Fang emphasizes.